Most appealing three bedroom semi-detached villa positioned at the end of a quiet cul-de-sac. The property is situated within the highly desirable East Renfrewshire school catchment area for both St Ninians High School and Woodfarm High School. Primary schools within the catchment area include: Our Lady of Missions and Thornliebank Primary School. Early viewing is strongly recommended. Well placed within the popular Thornliebank area and located approximately eight miles from Glasgow City Centre; the property is conveniently situated for commuter access to nearby M77/ M8 and Glasgow Southern Orbital. For those in need of public transport; you will find the nearest rail stop, Thornliebank station, less than a ten minute walk away. There are a variety of local amenities nearby including supermarkets, country and public parks, golf clubs and Silverburn Shopping Centre. Comprising of entrance porch, hallway, bay window lounge with dining area off, fitted kitchen with built in oven and hob, and rear porch. On the upper floor are located three bedrooms and bathroom with electric shower. The property benefits from gas central heating and double glazing. Three to four car driveway with carport. Front garden with privet hedge and lawn area. Extensive well-maintained rear garden gently tiered with central lawn area and paved pathway to all areas. Paved patio areas to upper and lower gardens. 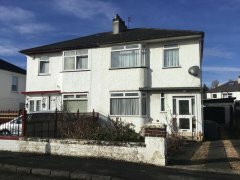 Offers Over £79,500 SOLD 37 Mb/s *est. Fixed Price £239,750 SOLD 38 Mb/s *est. Offers Over £170,000 SOLD 38 Mb/s *est.